When you come across good metal unexpectedly it makes for a real nice treat. That’s what happened to me today when I realized I forgot to look and see what was released this past Tuesday. With all the bands that have released new material over the last 6-weeks, I forgot to check and see what else was released. This is how I came across Insomnium. To the best of my knowledge, I never heard of this band before, but based on the band’s name, I guessed a couple of things correctly. A – they would probably be from Scandinavia and B – they would sound like they were from Scandinavia. If this were a final question on Rock Jeopardy, I would have won a lot of money. One for Sorrow was released on Tuesday the 18th in North America; a bit earlier in other parts of the world. 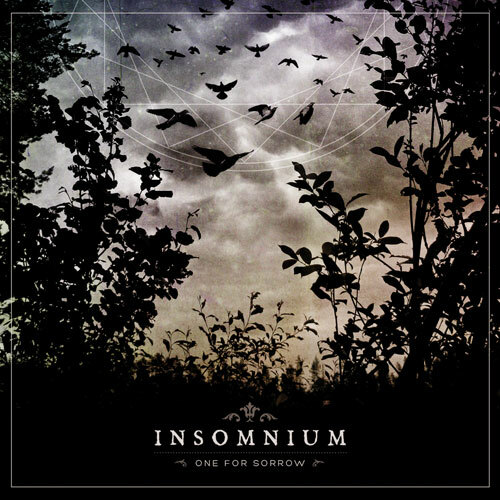 Insomnium created a piece of work that masterfully intertwined all the elements that make Scandinavian death/melodic/melancholy bands so great. It’s all there; the awesome guitar work; growling & semi clean vocals; and a melody that leaves you feeling beaten, bruised, and well…tranquil. Melancholy is supposed to make you feel sad and depressed, but in metal it’s more of a soothing effect…like the calm before a storm.